Raynor is a ranged Assassin and is capable of dealing rapid basic attack damage from afar. Despite being known as a beginner friendly Hero, his rework has ensured that he has greater depth and control over his kit, while still remaining simple. Despite that, he's capable of dealing very hig, rapid damage, while having two abilities that ensure he can survive. 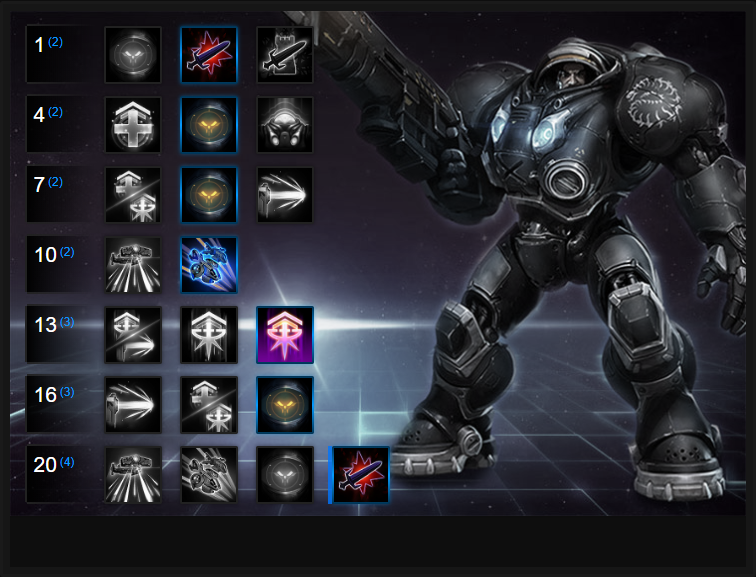 Although Raynor fell out of the meta for some time, his rework has ensured - for now - that he's incredibly strong. His solid damage, long range, self-healing and knockback make him a nuisance hero that's difficult to pin down. If left to deal damage, he can easily compete with most ranged Assassins. What I will say about Raynor is that despite him being labelled as a Hero for beginners, he still requires exceptional positioning and as long as he can maintain his basic attacks on squishy targets, he can carry most teams. Give 'Em Some Pepper (Trait) – Allowing Raynor to deal a spike of damage on his 4th shot, Give Em' Some Pepper also splashes to those behind your primary target. Irrespective of who you hit, your Trait allows you to eat a chunk of health while still pressuring a team. If you can, try to stand where the enemy will be splashed to ensure maximum damage. Penetrating Round (Q) – Several Raynor builds will focus on this ability, thanks to some useful Talents being available for it. This is your only form of crowd control, so it needs to be saved and used wisely, especially early on. Most often, you’ll want to use it for self-peel, to make sure you stay safe from any enemies jumping on you. In a situation where your team outnumbers the opponents, you can also use it to knock an enemy back towards your allies. If any enemy is super-low health, it deals more than enough damage to kill. Inspire (W) – Your basic attack is your focus, and Inspire helps to make it more potent. The increased attack and movement speed mean you can often harass or even all-in without much fear of retaliation. Keep in mind that this ability resets your basic attack, and also affects nearby minions and mercenaries, and should be used when you’re looking to hard-push a lane or at the start of a team fight. Be sure not to use it too early in a fight, as you want to ensure your attack speed bonus is maximized. Adrenaline Rush (E) – You need to always be aware of the cooldown of this ability. When it’s available, you can go for trades you wouldn’t otherwise win, thanks to the strong self-heal. This can result in making you surprisingly durable, something your opponents will have to respect. It might feel like it for a moment, but you’re not invincible even with this heal. Heavy crowd control thrown your way, or pure burst damage, will still cut you down. Hyperion (R) – While the damage to Heroes isn’t huge, this ability does have the advantage of being able to be used at the beginning of the fight, and then you can focus on laying down the DPS after that. One of the big advantages is that since the Yamato Cannon has been added, Hyperion will do significant damage to structures. Great for sieging on Battlegrounds such as Infernal Shrines. Raynor’s Raider (R) – The Banshee can be quite annoying for your enemies to deal with, and left unchecked, can dish out a frightening amount of damage . Depending on how a fight is going, you are able to select a new target for the Banshee, increasing its usefulness. If you choose to sic them on someone like Nova or Zeratul, due to constantly being attacked, they’ll be unable to enter stealth, providing your team an advantage. Be aware that once your Raider is called, it will always follow you, and can be directed using E. In addition, if it's not under attack it will regenerate health. Any Hero that's slowed or stunned allows Raynor to deal 15% more damage to them. That's a fairly outrageous boost to his basic attacks, especially considering Penetrating Round slows, but also if you pair with someone like Arthas. Ace in the Hole is mandatory. Sustaining Rounds provides Raynor with plenty of lane sustain, allowing his Trait to grant him 3% maximum health, up to 6% when hitting a Hero. It's an awesome amount of health return. Building on Ace in the Hole, Unstable Compound causes your Trait to slow when it splashes, while also increasing the splash radius by 15%, ensuring you can snare a back-line much easier. Incredibly annoying to fight against, Raynor's Raider can deal consistent damage to a single target and will continue to follow them during its duration. Lasting indefinitely if it's not destroyed, and dealing a good amount of damage, they zone out an affected player and boost your damage massively. Increasing Raynor's movement and mounted speed by 8%, Giddy-Up stacks with Inspire and gives Raynor some much needed mobility. It's particularly good when hunting down enemy players who are trying to escape. Acting like a sexxed up Giant Killer, Bounty Hunter causes your Trait and subsequent basic attack to deal 3% of your target's maximum health as damage. Bounty Hunter also allows you to trigger your Trait, to quickly one-two punch. If your Trait is just about to fire, use this immediately after for a double-whammy of spike damage. Execute bumps Raynor's attack speed by a further 20%, and increases his damage by 25% against targets below 50% health. Used with Inspire, and with Bounty Hunter, against a slowed target, Raynor's damage becomes ridiculous. These Hero Threat Levels (1 being lowest threat and 10 being highest threat) are to help you determine which enemy Heroes can give you a headache. Any Heroes that aren't on this list are easy pickings for Raynor. If a Hero is listed here, take greater care. The Butcher: His health regeneration from Butcher's Brand combined with Lamb to the Slaughter mean he can tie you down and kill you very quickly. Zeratul: His ability to burst from cloak means that at the very least you'll take a beating and be forced to use your knockback/heal. This list of tips and tricks are just a handful of things we think will help your Raynor play. We'll continue to add to the list as required and if you have any tips you'd like to share, let us know in the comments below and we'll place them here. 1. It's incredibly important as Raynor that you use your range to your advantage. You can attack from further away than most enemy players - use this to poke high value targets. 2. Try to position yourself so that you are near the back of any team fight. You need to be left alone to do as much damage as possible. 3. Your priority targets are those that are squishy. Li Ming, Kael'thas, Jaina - even Brightwing. Anyone who is high value should be shot. 4. Use Penetrating Round on a Hero that's capable of dealing high damage or one that's a threat to your squishiest team mate. The Butcher, Illidan or Thrall are good targets. 5. If you can, try to save Penetrating Round to interrupt or to peel for an ally under attack. It's also your only form of personal defence. 6. Don't be afraid to use Penetrating Round to finish someone off. Its damage is significant and its range long enough to snipe someone down. 7. Always, always, always use Inspire. It provides a significant attack speed to you. 8. Remember that you have control over your heal and when to trigger it. Just don't leave it too late, as it's effectively a glorified heal over time. 9. If you take it and with Hyperion, try to aim it towards a structure as well as enemy players. At the very least it will zone them out the way. 10. With your Raider, remember to control it with E to move it out of harms way. 11. Your Raider will always regain health over time when not taking damage. Be sure to preserve its life as much as possible.